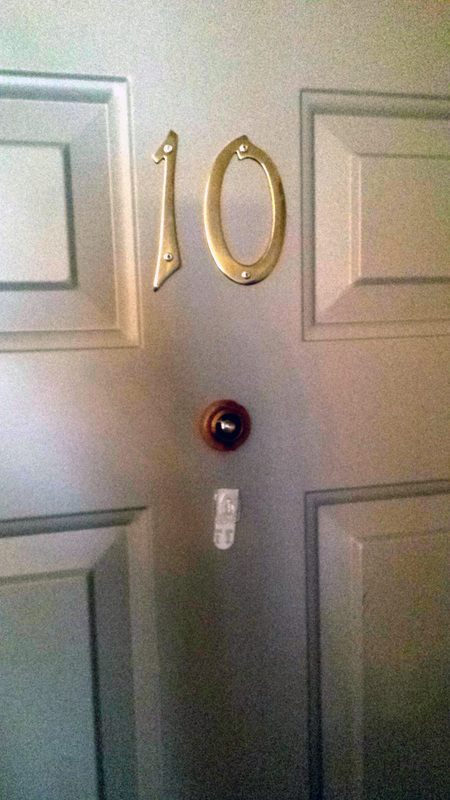 On Friday, we said goodbye to our lovely 2-bed, 2-bath on East River Dr in favor of crashing at my parents’ place, where there was still a real bed (the movers came for our stuff on Wednesday and we couldn’t face another night on the air mattress). We headed out to the Lorelei for a few drinks and hit the hay. 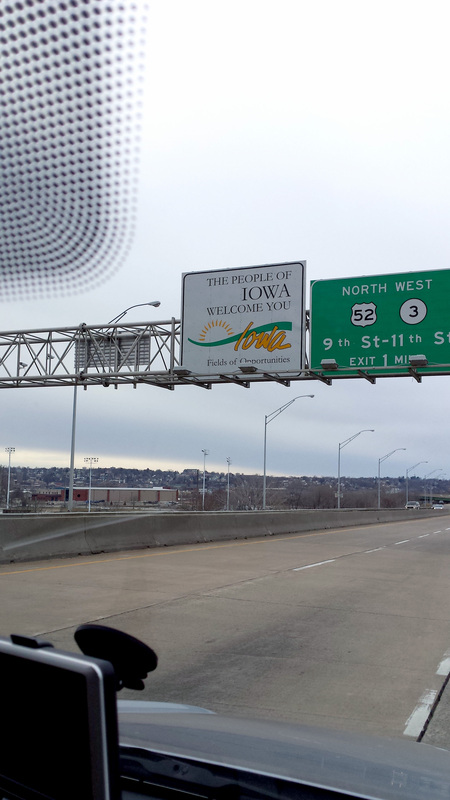 On Saturday we began our trip to California, with Wisconsin, Iowa, and part of Nebraska on the docket. The good-byes were hard and a lot of tears were shed. I won’t show pictures of the tears because that’s sad. Instead, here’s HWY 172. 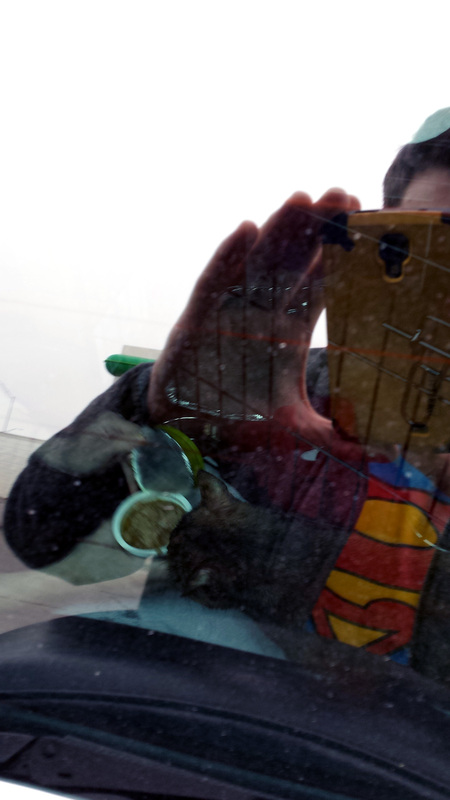 And here’s me getting gas all puffy-eyed. 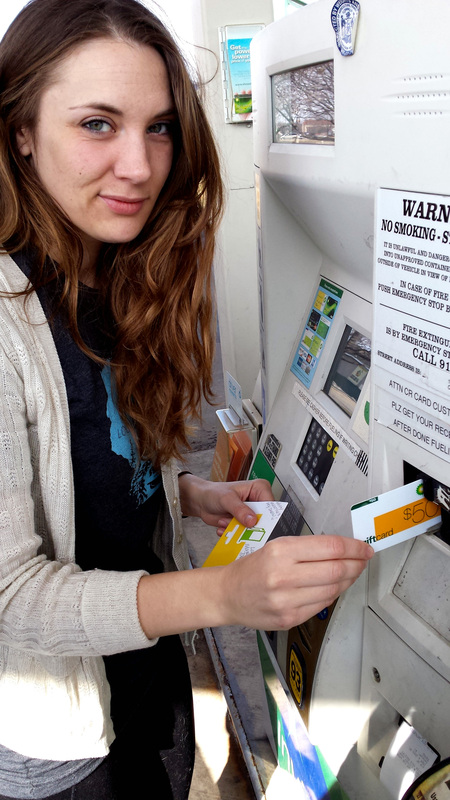 Using my Valentine’s Day gas card! Thanks mom. 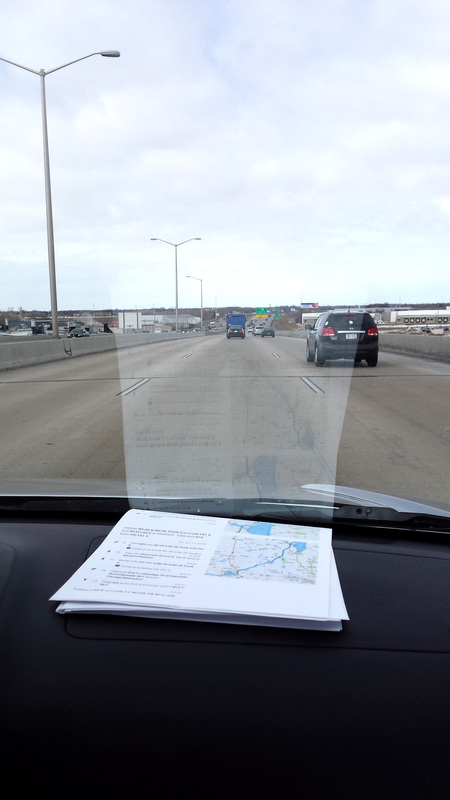 Wisconsin was pretty uneventful – I drove the whole way out. 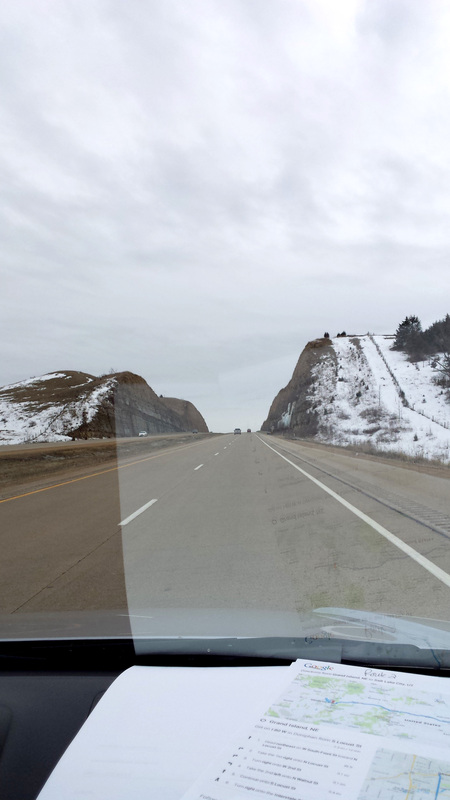 There were some hills towards the border. 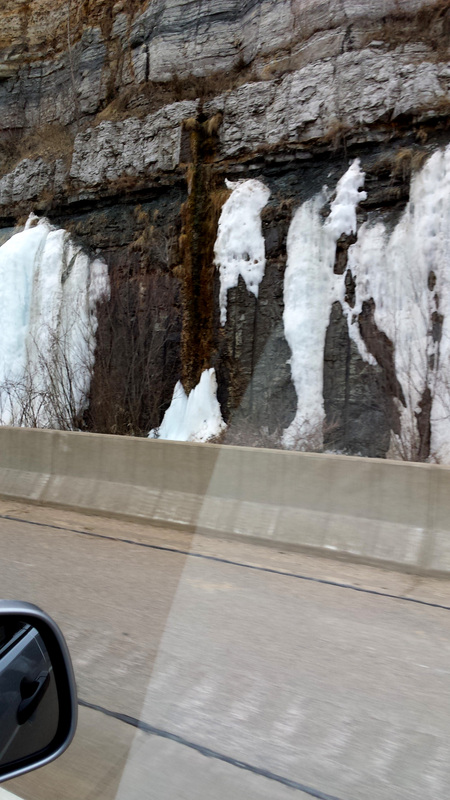 And as we crossed the Mississippi we got all kinds of majestic ‘Murica. 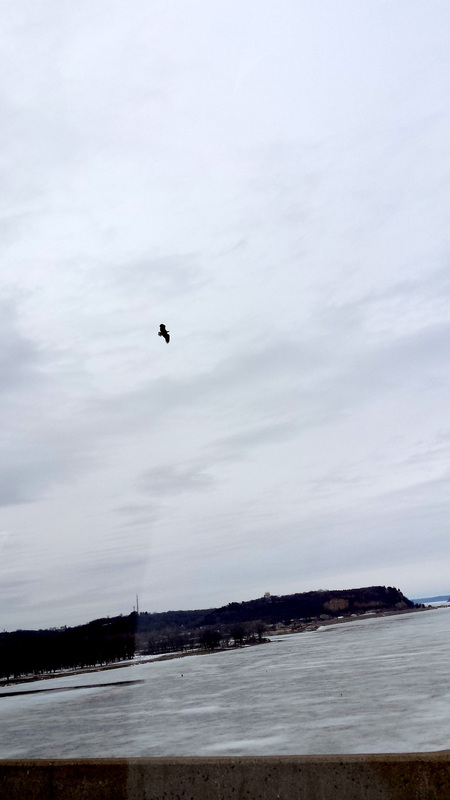 That right there is a bald eagle over the Mississippi. We stopped in Debuque for, uh, linner I guess, and got some Wendy’s. It was delicious. Iowa had already exceeded all of my expectations – I had not anticipated a beautiful river town with a Wendy’s right when I needed it. It was suprising. Debuque also welcomed us. 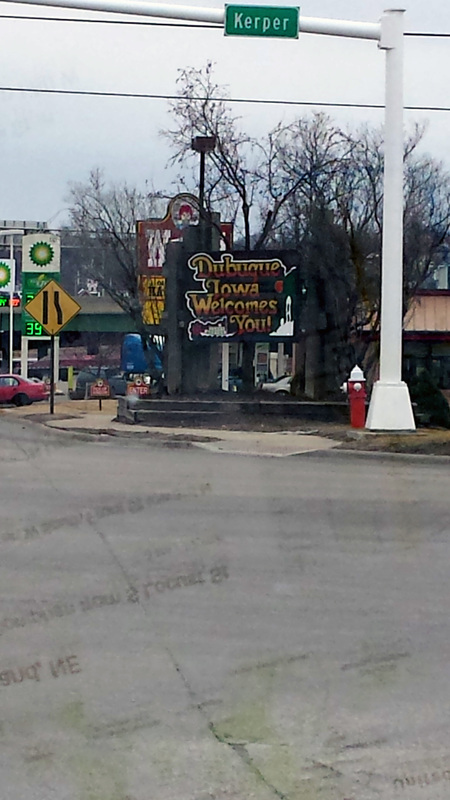 Iowans are very friendly, I guess. While we were there we also checked on the cats, who were doing okay. I gave Konan another sedative. It didn’t really effect her. 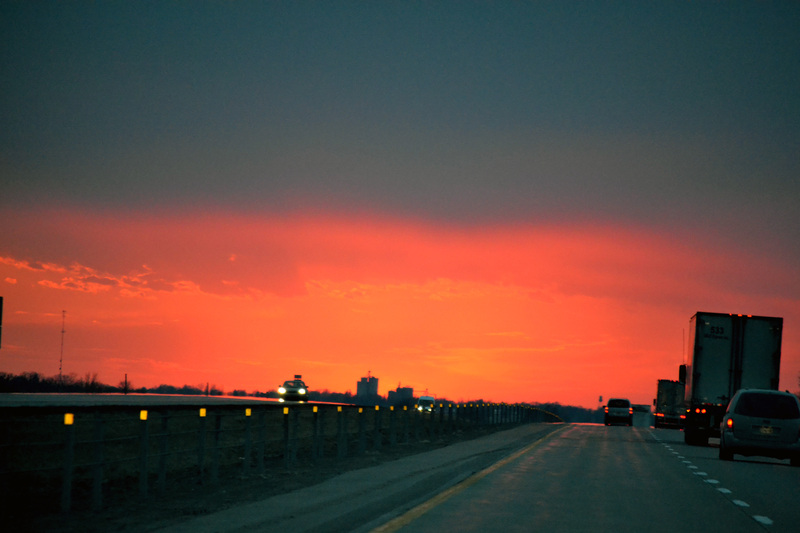 Then we switched drivers, and Darin took us most of the way through Iowa – which quickly became exactly what we thought it would be – a barren wasteland. What a lucky guy! 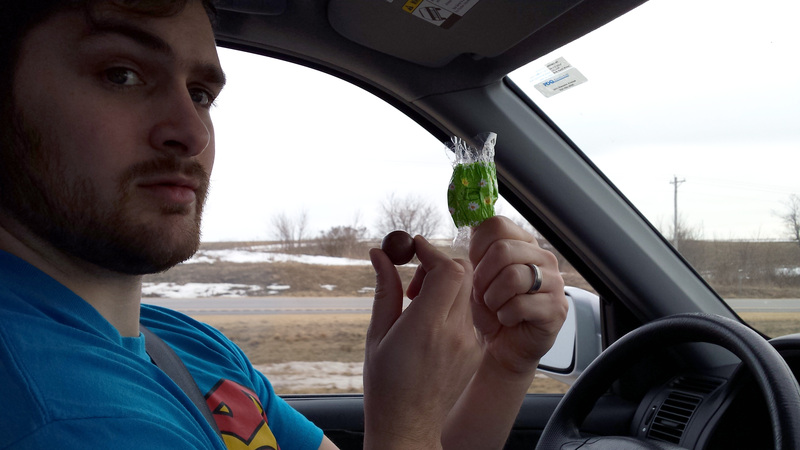 Darin eating a treat because damn, Iowa. 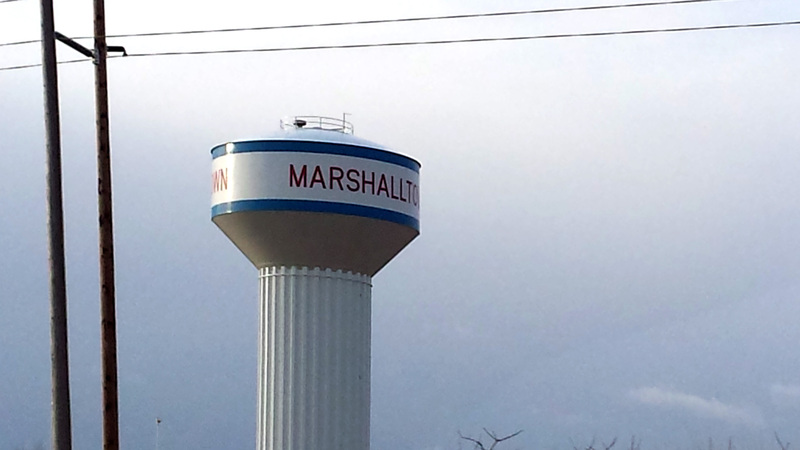 The funniest thing Iowa gave us was this “Marshalltown” water tower that Darin and I both misread as “Marshmallowtown”. It looks JUST LIKE the Stay Puft Marshmallow Man. Certainly not a coincidence. 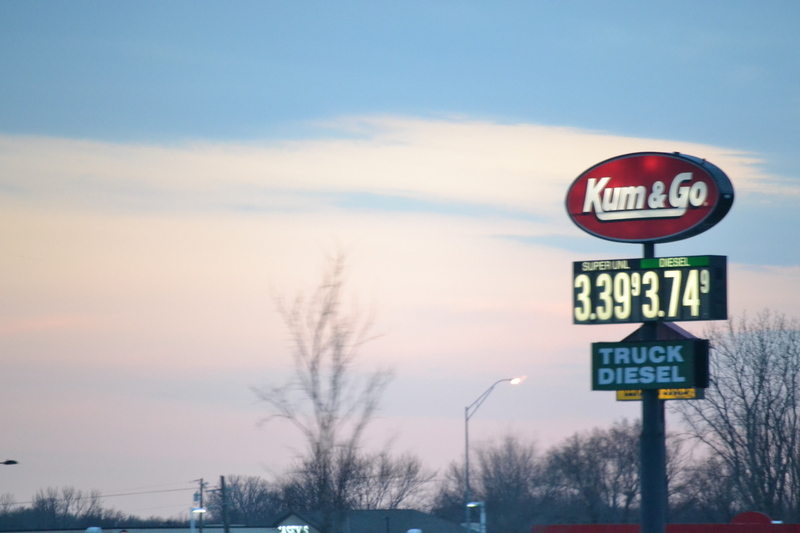 So there was that, and these “Kum and Go” convenience stores. Seriously? Who came up with that name? My dad? Brought to you by dad jokes everywhere. 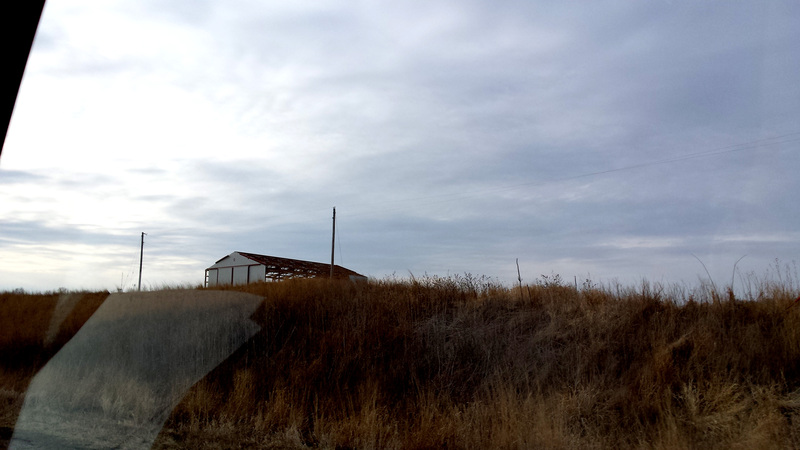 Things got really quiet after that as we neared the Iowa/Nebraska border – a place I’m pretty sure no one has ever wanted to go to. 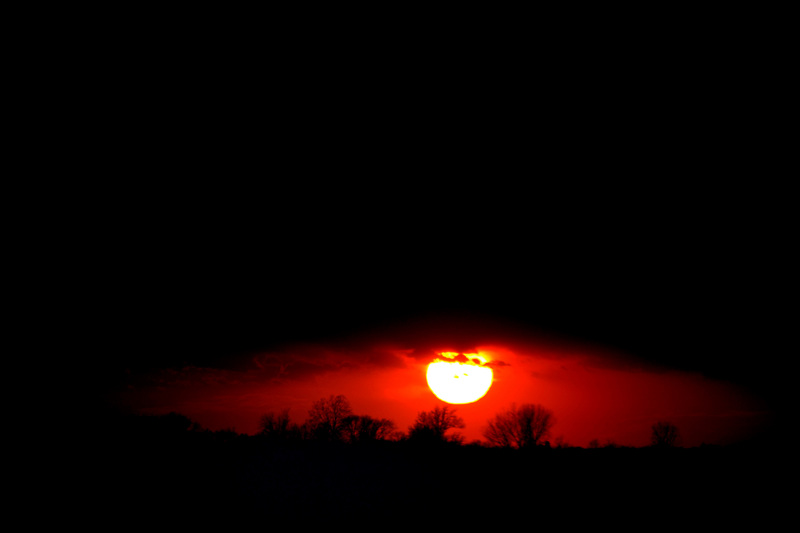 Then we were treated with an incredible sunset. 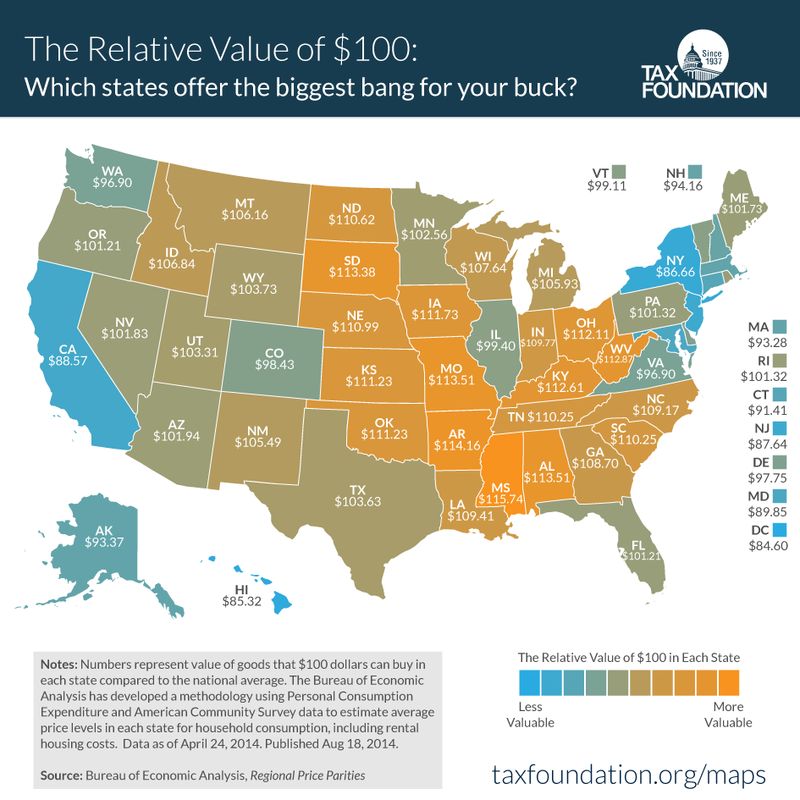 Maybe the Midwest IS best. It was beautiful. 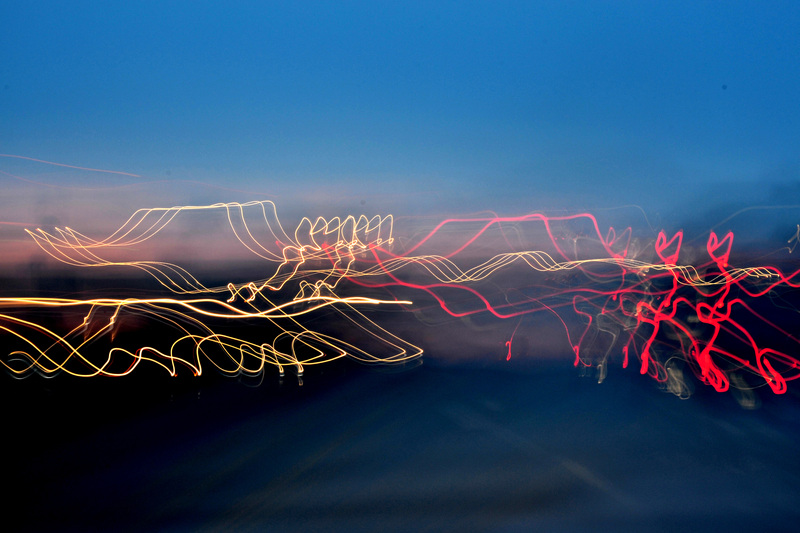 Then it got dark, and everything was a blur until we hit Nebraska. 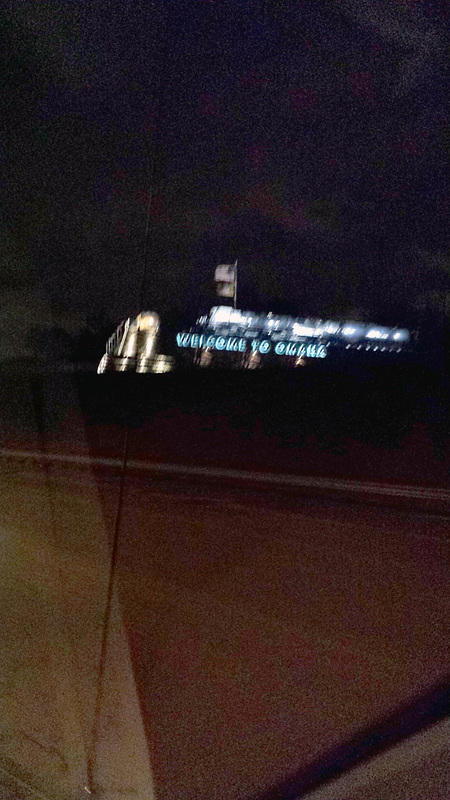 So blurry that we couldn’t even get a good shot of the Welcome to Omaha sign. We drove for a few hours and stayed the night at a Quality Inn in Grand Island, Nebraska. (For the record, it was neither an island nor grand.) The hotel was really nice, though, and the staff were friendly. The cats were finally let out of their kennel and were surprisingly well-behaved. After a brief freak-out period where the entire room was inspected at high speed both of them settled down. All four of us cuddled up and slept like a bunch of rocks.